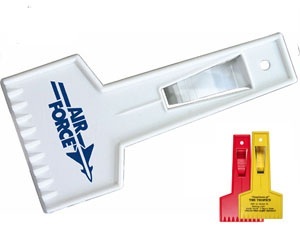 The credit card ice scraper is a small but convenient size of 3-3/8" x 2-1/8". Imprint area is 2-5/8" wide x 1-1/16" high. Made in the USA. Scraping edge will not mark glass.